Japanese Episode 237: "Inomuu to Fuyu no Yanagi!" English Episode 528: "Cold as Pryce"
Having finally arrived in Chouji Town, Satoshi wastes no time in finding the gym. However, the gym leader isn't there at the moment, so a woman named Shima leads the young trainer to him. Satoshi is surprised to see that the Gym Leader Yanagi is the same man whose Jugon saved him from the Red Gyarados! Yanagi recognizes Satoshi and calls him a fool for getting so attached to his pokemon, and after beating Satoshi in an unofficial match he feels that his point is proven. Just then, the Rocket-Dan appear, and in the battle both Yanagi and Satoshi fall down a cliff. As the two trainers look for a way out, Yanagi tells Satoshi about an Inomuu he had as a youngster. 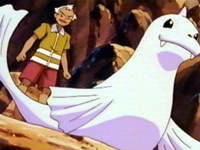 The two were good friends, much like Satoshi and Pikachu, until they had faced a Buubaa in battle. Yanagi had jumped in front his Inomuu to block it from a fire attack, and as the trainer lay injured his Inomuu left him and never came back. Satoshi and Yanagi continue through the cave when they spot Yanagi's Inomuu, frozen in ice! The large pokemon has an herb in its mouth, and Satoshi deduces that Inomuu didn't abandon Yanagi at all! It had gone out to find some herbs to heal his wounds, and on the way it fell into the cavern and got frozen. As Yanagi apologizes for doubting his pokemon, Satoshi uses his pokemon to thaw Inomuu. Satoshi, Yanagi, and Inomuu find the cave's exit, and after a battle with the Rocket-Dan, Yanagi agrees to battle Satoshi for a badge. To be continued! It took long enough, but we're finally on the way to the seventh Gym Leader match. And, as is the pattern in the Jouto League season, we have an episode that sets up who the Gym Leader is before the actual battling episode. And the anime producers actually did a good job of turning the cane-wielding old man from the video games into an interesting character. The emotional scenes at the end were a bit hokey, but you know how the anime has to turn every Gym Leader into a good guy. Ah well. The only thing I really have to wonder is where Yanagi's burn scars are. I mean, he got hit with a Fire Blast attack and had to be bandaged up and everything, yet when we see him without his shirt on at the beginning of the episode there's not a mark on him. Wouldn't you think there would at least be SOME sort of burn mark or other scar? 4Kids did their usual job with the dubbing of this episode, as in it was alright. I'm actually surprised they left the whole hit-with-a-Fire-Blast thing in, as it is a pretty violent scene when you really think about it. Inomuu keeps its Japanese voice. Pikachuu GETTO o Roketto-Dan no futari niwa! To capture creatures from their nests. Surrender to me, give up trying to plea, or we'll fight.